GTA is a vintage style ‘character’ compressor, designed like its muscle car name-sake for brute power, pure speed and to make a loud noise. It is stripped down for ease of use and has a unique vintage colouring on top. 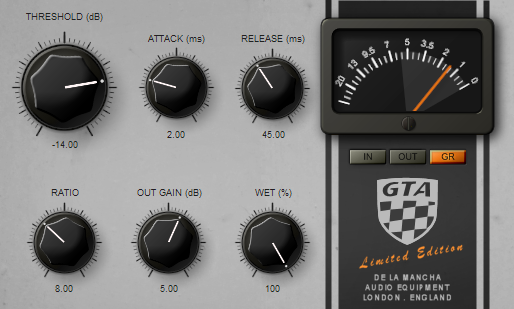 GTA is a peak compressor featuring super-fast attack and release times and has a wide range of threshold, ratio and output boost as well as a wet/dry mix for NY compression. The metering covers input, output and gain reduction, showing both real-time and peak levels. GTA was previously unavailable to purchase or download, it was an extra bonus plugin if you bought the GTO/GTX compressors. Now they are no longer available to buy, I’d thought I’d let GTA go free.